Hugo and Stella Wirsky, doing business as "Argentina Safari,""" host four U.S. hunters (Ken Wilson of Sportsmen on Film, Lad Shunneson, Dave Harshbarger, and Tom Grimes). The results are exciting from start to finish. A Sportsmen on Film DVD production. 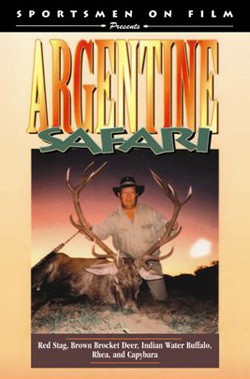 Hugo and Stella Wirsky, doing business as "Argentina Safari,""" host four U.S. hunters (Ken Wilson of Sportsmen on Film, Lad Shunneson, Dave Harshbarger, and Tom Grimes). The results are exciting from start to finish. In the southern hunting camp, Red Stag are successfully hunted in the middle of the roar and Rheas (the South American Ostrich) are hunted for the table. Then, in the northern camp, Ico, the gaucho guide, leads Ken to an old Indian Water Buffalo bull; Lad and Ken each shoot a Brown Brocket buck (the diminutive but highly prized indigenous deer) and Capybara (the world's largest rodent) in beautiful, tropical country.